A black plastic box that appears to be from the 1930's or 1940's, made in Austria. Uncertain whether this is the first edition or not. It includes the patent number on the cover, which was approved in 1938. Two small divots on the underside have "1697a" in one, and "FW" in the other. 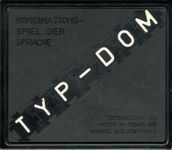 According to the Österreichisches Spiele Museum in Austria, this indicates the publisher was Franz Weigl.